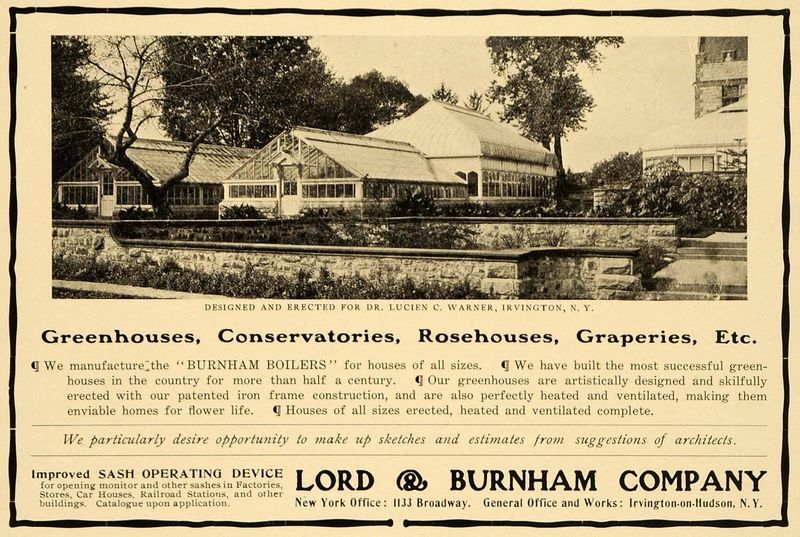 A Lord & Burnham advertisement for the greenhouses at the Dr. Lucien C. Warner estate in Irvington, NY. Warner was a chemist, manufacturer and co-founder of what would become Warnaco Group. I am told that the Lord and Burnham Company went out of business a decade or so ago, leaving anyone desiring a greenhouse or conservatory today with pretty dismal choices (even the expensive ones available have a terrible "do it yourself", "from a kit" look to them). A friend of mine told me that there are several individuals who buy the old Lord and Burham frames from owners of old estate who no longer want them, recondition them (the old frames that have survived were typically iron)and resell them to new owners at horrible expense. My friend just bought one- some forty feet long, 20 feet wide and at least ten feet tall. I must admit that I am consumed with envy. Why would anyone get rid of one of these!!?? I guess the time and the cash for maintainence....I still dream of owning land enough to have a large complex of these. Isn't there a company from England that has been around just as long and still makes solid steel and glass frame structures like these? Face it Magnus, you need another greenhouse; or at least access to one. 2) Maybe one the estates who have let their greenhouse go (like 'Chelsea' in Zach's 8.19.11 post) would let you take over theirs just for maintaining it. It would be a mutually beneficial arrangement. As I'm sure you know ... life is too short. Sorry, sublet was the wrong word -- I meant to say lease. I meant to use sublet under No. 2 by saying if the greenhouse is too large or expensive you could sublet part of it -- I have a feeling that would not be difficult given the comments here. Here is a link to the Estate in later years called, Richmond Hill. It house stood until the 1970s. From the website of Under Glass - "Under Glass Mfg Corp is the exclusive manufacturer of the Original Lord & Burnham greenhouses and solariums. We were established in 1989 after acquiring the Lord & Burnham product line."